Product prices and availability are accurate as of 2019-04-23 18:44:33 UTC and are subject to change. Any price and availability information displayed on http://www.amazon.co.uk/ at the time of purchase will apply to the purchase of this product.
? 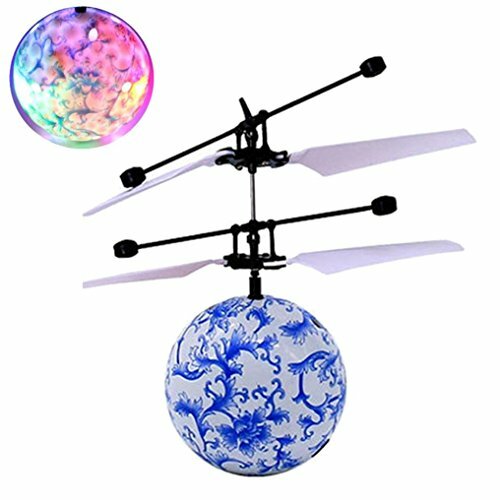 It is like a toy helicopter but instead of the usual helicopter cabin and body it features a clear glass ball. When you turn on it, it will emitting a brilliant light, very beautiful!
? It is motion-sensitive so it detects nearby objects and is programmed moves away from them. The idea is that you launch it and then hold your hand underneath it to keep it in the air. It continuously detects your hand and moves away from it. You or your kids, families will enjoy this amusing and fatastic process.
? The ball contains the battery and motor and also some flashing LED lights. When you turn it on the lights flash brightly. It has great visual appeal for any child. It looks fantastic at night in a darkened room. It is also very therapeutic if you are stressed out after a hard day; especially at night when the lights show up brightly.
? Use of environmentally friendly non-toxic materials; rechargeable. Products after several tests, owns resistance to fall, the wings are not easy to break, etc. Not easily deformed. Very easy to clean!
? A key to open,simple operation,easy to play.
? Below the sensor automatic induction obstacles,keep flying not fall to the ground.
? Abandon the traditional craft characteristics of silent,make flying more interesting.
? Jammed automatic power-off protection system,let parents don't worry about their children safe and happy.
? Any infrared remote control can control the aircraft,press the remote control switch, start the flying ball.
? With the perfect combination of peal modeling,color light make the color infinite changes,more attractive to children.